Hill Top At Easter, After Great Dane’s Good Friday! 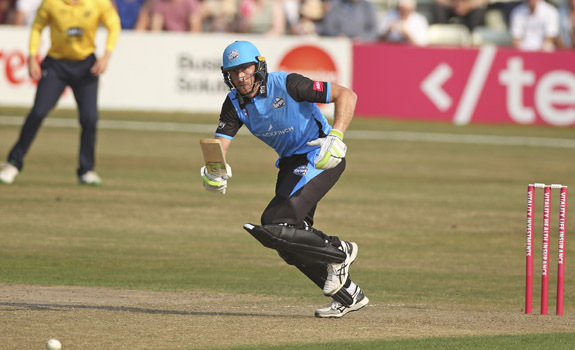 The 2019 cricket season is now well under way, and the Easter holiday heatwave yielded a veritable parade of Royal London One-Day Cup hot hundreds. With the World Cup imminent and the promise of some scintillating scoring this Summer, it was Lancashire’s Dane Vilas who led the chase for this year’s Walter Lawrence Trophy with a 66-ball century against Nottinghamshire on Good Friday. That match boasted 823 runs, 3 centuries and 34 sixes, but despite Vilas’ 166 and team mate Steven Croft’s 110, which included a 69-ball hundred, Lancashire fell 11 runs short of Notts’ 417-7. Vilas’ lead for the Trophy was short-lived, however, as Leicestershire’s Lewis Hill took up the baton on Easter Sunday, April 21, with a 54-ball hundred against Worcestershire at Leicester. The 28-year-old wicket-keeper/batsman went on to score 118, including 16 fours and 4 sixes, and shared in a fourth-wicket stand of 200 with Colin Ackerman, who scored 152 off 143 balls, propelling his team to 377-4 and a 38-run victory. The Leicester-born Hill, is a product of the county’s academy and joined the staff in 2014 before making his first-class debut in 2015. Now in its 85th year, the Walter Lawrence Trophy, awarded for the fastest hundred of the season, is open to all domestic county competitions as well as One-Day Internationals, T20 Internationals and Test Matches in England. Dan Douthwaite of Cardiff MCCU is the front-runner for this year’s MCC Universities Award with an unbeaten 100, scored against Sussex at Hove on March 31. Batting at number 7, in only his second first-class match, Douthwaite’s hundred included 10 fours and 4 sixes in the drawn game. The 22-year-old, who was born in Kingston-on-Thames and educated at Reed’s School, Cobham, came up throught the ranks at Surrey from Under 13s to 2nd XI level before joining Warwickshire last year.